Lovely. It never even occured to me to use a decorated tag, derr! I like that tag Steph and your colours. I am the lucky owner of this one, It's great, I love the card which has the design continuing over onto the back. what I call luxury card. yes it looks like it will make into a lovely card. 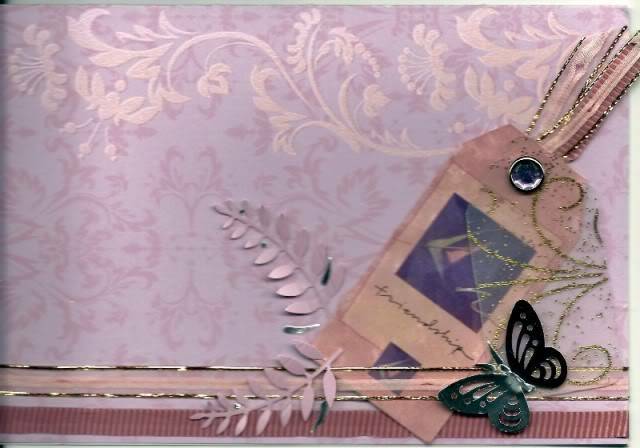 Here's what I did with it, being me I used what I think you'd call the back, but such a lovely card it was quite hard working out how to use it and see the flourishes and flowers. I pulled the ribbons off the tag and used them across the bottom, and still had enough to put some back on the tag. 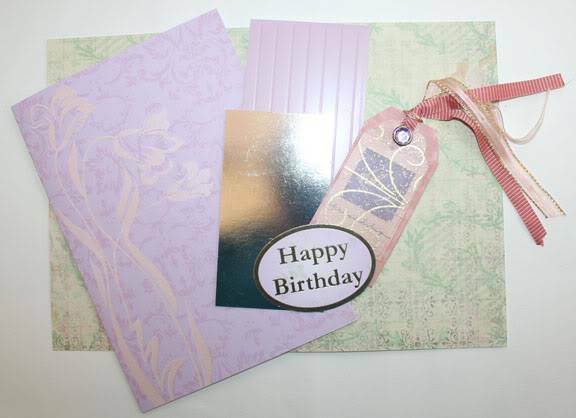 I didn't use the lovely green paper but put the Happy Birthday die cut inside. I used some of the holes from the butterfly to slip between the fern leaves. I'm going to send this to my friend in Bognor next week, she's had both hips replaced a few months ago. Ooooh, Karelyn. That's really lovely. this is lovely. well done. Oh well done Karelyn - you made a smashing job. Afraid mine is still in my 'Crafts Pending' box. This is beautiful - and so "me" !!! Pity it's already allocated or it would have your name on it.